The small hamlet of Shangba is a tiny jumbled collection of houses sitting in the lush green paddy fields and hills of southern China. It sounds idyllic, but many of the locals are dying after drinking polluted water. Shangba has become one of the country's growing number of what have been called "cancer villages". A broad river runs to the side of the village, its shallow waters rippling over smooth stones. In the past the villagers relied on the river for drinking water, and to irrigate their crops. What they did not know was that mines further upstream were dumping their waste into it. And they're still doing it, there is a thick red residue at the water's edge. Walk along the little paths that wind their way through the paddy fields outside the village and many of the streams that you pass are a rusty orange colour. 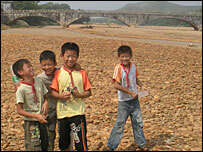 Scientist Chen Nengchang has been studying the cause and effects of the pollution on the village. He has found high levels of poisonous heavy metals in the water. He believes there is a direct connection between incidences of cancer and mining in the area. His team is working on ways to make the village's rice crop resistant to some of the chemicals in the river. "The mines are producing heavy metals which have polluted this area" he said. "Cleaning it up will take years and really we have a huge job on our hands. We have managed to get the authorities to supply clean drinking water, but there's still a long way to go," he said. For many villagers it is too late. One campaigning Chinese newspaper said 250 people from the village's population of 3,000 have died of cancer since 1987, although statistics in China are often unreliable. Wang Yan lost her mother and husband to cancer last year. "The disease destroyed them," she said. "They just got weaker and weaker until they couldn't go on any longer. Now I am left here trying to get by as best I can and look after the children"
The office of Shangba's local Communist Party official, He Shouming, looks as though it has not changed for decades. Old photos of comrades gone by are still on the wall. But Mr He is a man rapidly losing faith in the party. "We have appealed to the mine and to senior officials to stop this," he said. "But so far nothing has happened. I have one family of three young children who have lost their mother and father. 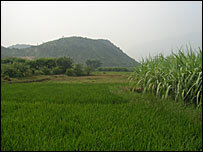 Our rice crops have failed because of the polluted water. What am I supposed to do? We can't afford to move, so we are stuck here." This is a situation repeated across China. Some 320 million people drink polluted water every day. The government has promised to take action. Last year it pledged to spend billions of dollars to bring clean water to 160 million farmers by 2010. But that would still leave many more without fresh supplies. The reality is that the government it having to play catch-up. For the past three decades successive administrations have put economic growth ahead of the environment. And now it is the residents of Shangba, and thousands of other villages up and down the country, who are paying the price.